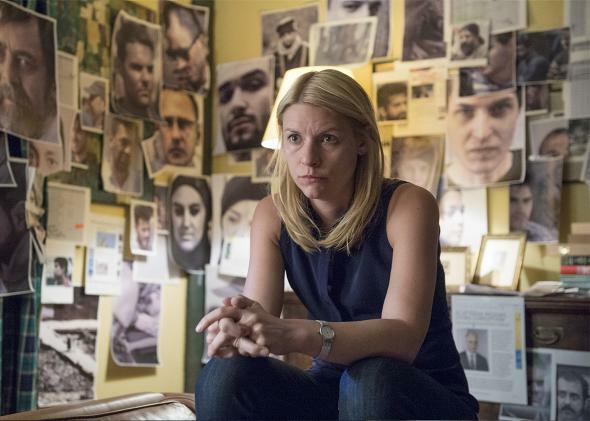 Homeland season 5 with Claire Danes, reviewed: Showtime’s thriller didn’t need more nuance. Season 5 turns the show into something more complicated, moody, and dull. Claire Danes as Carrie Mathison in Homeland. Something is missing from the fifth season of Homeland, the Showtime thriller starring Claire Danes as a bipolar-savant CIA analyst that has lost and regained its footing more times than a gymnast with a charley horse. It’s not just the bit characters, like for-hire surveillers Max and Virgil, who often served as off-kilter foils to the show’s grim main cast, which has been narrowed this season to a core four. Nor do I mean last season’s delicious rogues gallery, which included a balls-out-malevolent Taliban commander and a Pakistani intelligence agent as brilliant and uncompromising as Danes’ Carrie Mathison; this year’s villains almost seem deliberately forgettable. No, the first thing that’s conspicuously absent, at least in the three episodes shared with critics, is Homeland’s opening title sequence, whose antsy trumpet runs and jittery gurgles of feedback placed viewers somewhere between a smoky café and a CIA black site. It was a chaotic, free-jazzy, attention-jolting table-setter to a show that often thrived—at least when it wasn’t completely bonkers—on Carrie’s chaotic, free-jazzy, utterly diverting spycraft. Season 5, which picks up more than two years after last season’s boom-clap climax and measured denouement, offers neither the candy-hued crazy of Homeland Season 3 nor the tightly plotted thrills of Season 4, but rather something more ruminative and sedate. Carrie has left the CIA and is working for an industrialist’s humanitarian foundation in Berlin, where she has decamped with her young daughter. She has had a falling out with Saul Berenson (Mandy Patinkin), who is back with the agency but has failed to win the directorship he coveted, though he’s still plotting world-shaking chess moves with his black-ops colleague Dar Adal (F. Murray Abraham). Peter Quinn, the laconic superspy who left for a special forces mission at the end of Season 4, has spent 28 months killing ISIS fighters. And though the episodes shared with critics contain no shortage of bombings (two), attempted or successful assassinations (three), and assorted acts of skulduggery, the show somehow feels as high-octane as a Pinter play. Long, moody silences abound. Last year’s Homeland season opened with Carrie ordering a drone strike; this year she’s taking communion in a church. It is a little remarkable how emphatically the creators of Homeland, whose ranks include two veterans of Fox’s jingoistic terrorism thriller 24, are now questioning not just the tactics of the war on terror they’ve dramatized for five seasons but their characters’ very raison d’etre, at least for dramatic purposes. They hardly need to. This is, after all, a show in which the terrorists more or less always win. (Blew up Langley? Raided a U.S. embassy? Check and check.) Homeland has always been suspicious of the good its purported do-gooders do, even though it hasn’t always interrogated their more morally dubious methods. (And it only goes so far this season: In one cringe-y scene, Carrie contorts to rationalize the reliability of some information extracted under torture.) But the show has never laid on those doubts so thickly. As always, Homeland gets much mileage out of real-world events, from the Syrian civil war and its accompanying refugee crisis to the cultural tensions that have arisen from Europe’s growing population of Muslim immigrants. The surveillance state comes in for a whacking, with a hacker (one part Snowden, two parts Anonymous) snatching evidence of a U.S.-German spy program and delivering it to a journalist (Sarah Sokolovic) whose name, Laura, can’t be an accident. And there are whispers of a plan to depose Syrian dictator Bashar al-Assad, which at the very least makes Homeland’s present concerns feel especially timely. When things in Lebanon go haywire—as of course they must—Carrie slips into a familiar role, going rogue with her live-in boyfriend (Alexander Fehling) in order to track down a deadly scheme, one that may have its sights trained on her. It will also spoil nothing to reveal that, once again, Carrie goes off the meds that keep her level, the better for her to understand where the various threads she has glimpsed lead. That notion—that Carrie can deploy her bipolar disorder as a kind of superpower—has always been one of Homeland’s trickier devices, at once deepening a rich protagonist and threatening to cheapen a serious mental health condition. In this case, Carrie’s epiphany does come, but it doesn’t involve Who’s Plotting to Do What. It’s about her. So what are we to make of this inward-looking, penance-seeking Carrie and the gloomy, occasionally snail-paced new Homeland she inhabits? Viewers will have to decide how much good faith the show earned with its redemptive fourth season as its fifth one crawls in the direction of a plot. If this is the season in which Homeland aims to resolve its own contradictions and to deliver to its tortured characters some measure of understanding or peace, it would benefit, as my colleague Willa Paskin has noted, from a little bit more crazy. But for now, for better or for worse, I’m with Quinn: I have no idea what this is adding up to.